I've always admired the retro flair of accessories from Latico's Vyntage collection, and this braided baguette is no exception. What the line cleverly creates the perfect balance between vintage design and contemporary style. The clean baguette shape is given interest with some carefully placed, curved seams. 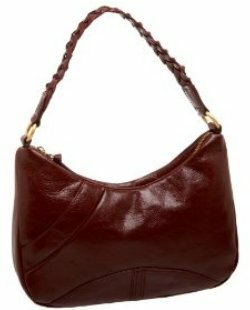 The braided shoulder strap is another feature designed to make this simple purse seem a bit more enticing, and visually it does the trick. It's not likely to be as comfortable as a flat leather strap, but it probably won't be uncomfortable enough to break any deals. Unzip the classic zippered top and you'll find a pretty paisley lining made from durable plainweave. That retro print is a bit dazzling, but it's worth focusing your eyes to see the zip and slip pockets on offer. You might be able to find something similar for less at your local thrift store if you're lucky, but $149 still isn't a bad price to pay for this pretty retro purse. The Latico Vyntage Framed Baguette bag, a great alternative to this baguette bag.